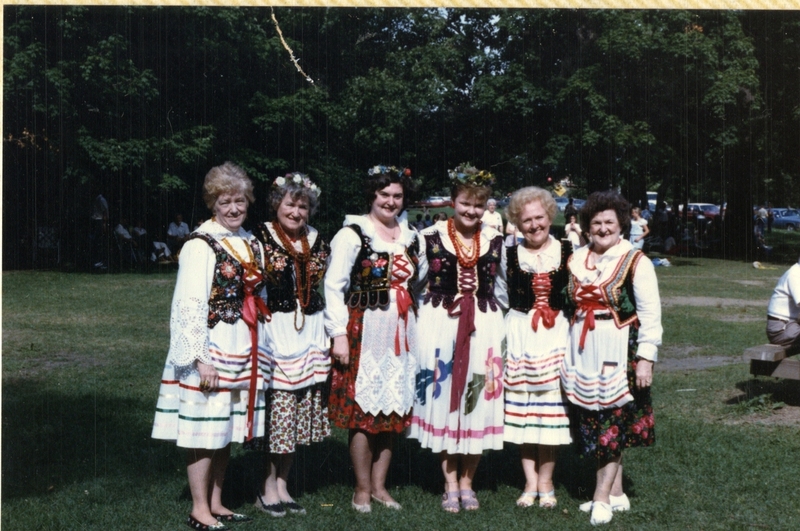 Members of the Legion of Young Polish Women in traditional dress at the Swietojanki festival in 1985. Transported to Chicago, the Swietojanki festival became a favorite summer time event. Money was raised through selling food—from Polish bigos to American hot dogs—and beverages at the event and there was often a raffle as well. Legion members, some in traditional Polish dress and others in their everyday clothes, mingled with the guests. The highlights of each festival were the performances by costumed adult or student dance troupes as well as the wreath floating ceremony. Children in traditional dress pose in front of their artwork at the Swietojanki festival in 1994. A newspaper article from 1971 advertising the Legion’s Swietojanki festival and explaining the festival’s history. Click here to read the full article. Anita Franuskiewicz selling wreaths she created for the Swietojanki picnic in 1993. 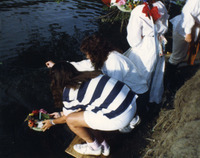 Young women throw wreaths, or wianki, into the water in hopes that the wreaths’ movements will reveal their future love lives.